BE Event Hire offers a large selection of tables hire for every occasion. We can supply as little as one single table up to 10,000 traditional 6ft tables. Whether you need trestle tables, round tables to benches for a wedding, workplace or outdoor event, we can supply and deliver 7 days a week nationwide. **Table size guide available at bottom of guide to check seating numbers and tablecloth sizes. Wooden trestle tables featuring tongue and groove construction and sturdy folding legs which allows for easy storage. Suitable for heavy use in any Indoor or Outdoor Event. Varnished Trestle Tables have gloss varnished plywood tops and folding metal legs which allow for easy storage. Sturdy blow mold plastic trestle table with steel folding legs. These tables are easy to wipe down so are suitable for use as catering tables or for general use in and around the house. They fold flat for storage, are 73cm high and 14.5kg. Our trestle tables are lightweight but sturdy, making them very versatile to suit any event. They’re also very easy and quick to erect, meaning your event can be set up in no time at all by our helpful staff. Visit our furniture sales site to buy trestle tables. Varnished plywood top round tables with steel folding legs also known as banqueting tables. These tables are very sturdy and are ideal for use at weddings, dinner parties and corporate events. The six foot tables can seat seat 10 – 12 people comfortably down to the three foot table which make an ideal table for two. The plywood round tables stack neatly when not in use, are 77 cm high and have a rubber edging. Bistro tables are typically round and either seat two to four people depending on diameter of table. If you are thinking of hiring Bistro tables for your cafe, bar, event or conference, no matter how large or small, BE Event Hire is pretty much unbeatable on prices and service. Aluminium bistro high table. Featuring high polished aluminium table top and pedestal style leg or black metal frame with wooden top, 600mm in diameter and stand 1100mm tall. 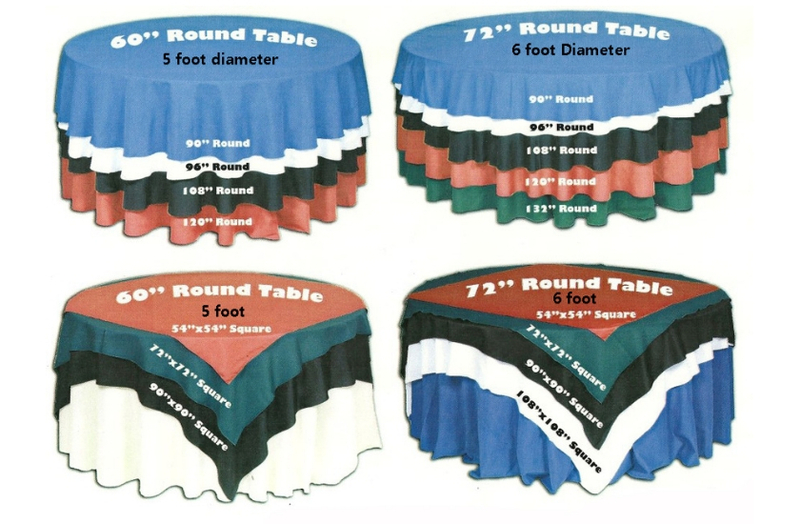 The table cloths listed are round table cloths, these could be replaced with square traditional 118″ x 118″ and 90″ x 90″ tablecloths.